It was traditional for a discus thrower at the Olympics to present his discus to sanctuary officials after having it inscribed and dedicated to a god. While in Olympia we held an ancient discus inscribed with the words, "Kleon threw me to win the wreath." 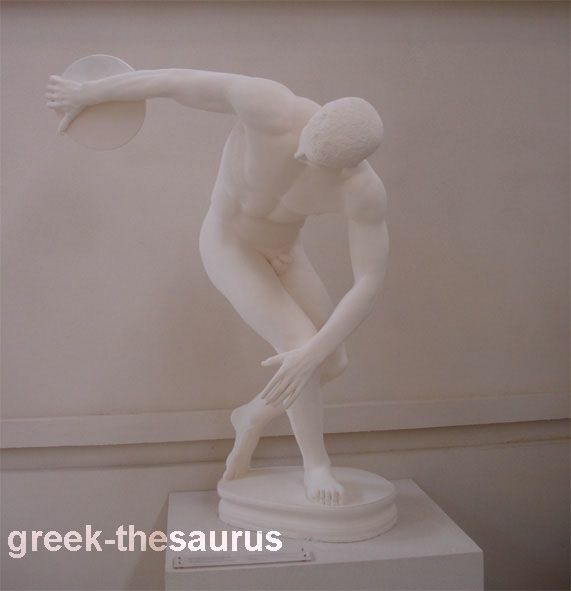 The experience inevitably was an emotional one; in our hand was the discus, symbol of the highest ideals of Greek athletics; a metal discus thrown in an event of the fifth century B.C. Standing in the stadium at Olympia, we had to curb a spontaneous, joyous urge to throw the discus into the air. The discus of antiquity usually was fashioned from metal, though a discus made of stone was permissible for competition. Each quoit-shaped discus was tapered from the center to the thin edges, which made it easy to grasp. The diskoi, studied in various museums, range in diameter from eight to eleven inches; in weight from five to twelve pounds. Apparently there was no official standard for the size or weight of the discus to be used in competition. Again, as with the halteres for jumping, the size and weight depended on individual preference of the contestant. His discus was made to his specifications, to suit his style and technique for throwing the greatest possible distance. balbis, or throwing cage, he was permitted freedom; he could stand forward or to the far right or to the far left; but, if he stepped outside any one of the three lines while making his throw, he was immediately disqualified. Statues, vase paintings, and literary descriptions of events create some confusion about the science of throwing the discus. Conflicting written statements and illustrative evidence of differences in techniques make it difficult to arrive at a clear concept of general principles. One certain fact is that the Greek discus thrower warmed up with a swinging of arms similar to the actions of a baseball pitcher. Variations in throwing methods proceed from a basic starting position: a firm stance facing the direction of throw. The athlete arched his arm and hand, moving the discus backward and forward several times and, when ready to throw, advanced his left foot straight out in front, and placed his right leg, knee bent, to the rear, the right foot on the ground. The Greeks hunted with javelins, then fought with javelin weapons, and eventually tested their skill with the javelin in athletic competition. It is believed that the Greeks were the first to use javelins for sport. There was no deadly point on the sporting javelin; its tip was a blunt piece of metal. Like the halteres and the discus, the javelin varied in size; weight and length were a matter of personal preference. In general, the javelin was about six feet long and about an inch and a half thick. The Greeks used a leather thong which was not permanently attached; it was approximately sixteen inches long and looped at the end. Each man wound the thong tightly around his javelin shaft, leaving the loop dangling so the middle and index fingers could be inserted into the loop for the throw. When the contestant threw the javelin, he held on to the loop; the thong unwrapped to give the javelin a forward thrust and a spin. The principle was similar to the boring on the inside of a gun barrel that gives a spin to the bullet as it is ejected. There was no rule about where the thong should be wrapped around the shot. Each javelin thrower discovered, through practice, where thong-wrapping would give him the impetus for throwing the greatest distance. From literature we gather that many athletes preferred to have the thong back of the shaft center because such positioning gave greater spin and distance to the javelin. In practice and competition, the thrower wound the thong tightly over the shaft, testing over and over again until he was satisfied with the security of the thong and its position. The javelin, cradled expertly in the circle formed by index finger and thumb, lay across the palm of the contestant's upturned right hand. With a stance of right leg back, left foot firmly placed in front, the contestant extended his right arm as far back as possible, right shoulder dropped so the javelin shaft pointed upward. At the moment of throw, the athlete took a few hop-steps forward, swung his right leg forward, and put all of his precisely controlled strength into the throw. The javelin spun forward and upward, out into a graceful arc, and plummeted to the ground; soft earth sprayed from the point of impact. Judges rushed forward to put a peg in the ground where the javelin landed. The throw did not count if the javelin landed to the far right or left of a specific sector marked for competition. And the farthest throw was not always the winning throw; as in all Greek events, grace and technique were of prime consideration. Judges voted against a throw that was ungainly or a technique employed simply to gain a few inches, just as surely as they voted against wild throws that careened or veered off beyond the measured area for competition.